The device is designed for simultaneous viewing and shooting objects in the field of vision of the MBS-10 microscope in transmitted or reflected light. The device is fastened on the microscope in place between the body and binocular attachment. The complete set of MFU includes the attachment for digital zoom camera with unchanged lens and switchable beam splitters that allows to direct all the light to the binocular eyepiece or split the beams and direct about 50% of light to the 3rd ocular or camera. 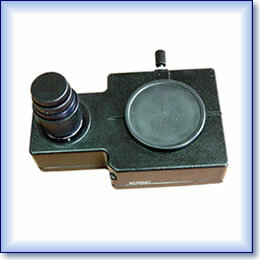 You may watch the object under different magnification at the same time, arrange 3rd ocular for instant measurements, install 35 mm photo camera, Polaroid, SLR digital or CCTV camera by using appropriate Universal Mount Adapter M42x1 that can be supplied additionally in delivery set upon a request.